I have written previously about the gentrification of the Cambridge dining scene that took place during the mid-noughties. 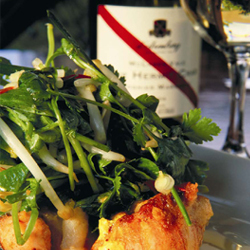 Looking back, the one that started it all was perhaps the transformation of the rather scruffy King St Run town pub into the smart, sophisticated and quirky yet unpretentious urban gastropub d’Arry’s, serving the kind of simple but well-made pub foods that match well with the riper and more fruit-driven flavours of New World wines such as Australia’s d’Arenberg which provides not only most of the wine list but also the name itself. 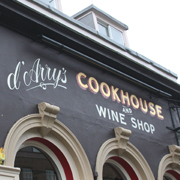 We first visited d’Arry’s within a few weeks of it opening and soon became regulars, enjoying the relaxed sophistication of its funky interior, friendly service and well-made but unpretentious food. The prices were also very reasonable and it was the kind of place where one could take young children during the day and not feel out of place. However, over time, d’Arry’s dropped off our radars as other, newer, smarter places opened and we just never quite felt the need to go back to that quiet, somewhat backyard-ish corner of central Cambridge where it is located. Moreover, d’Arry’s has also had something of a run of bad luck with not one but two kitchen fires to cope with and it’s fair to say it has lost something of its original buzz. A few weeks ago, new manager James Storey invited me to meet him for a cup of coffee to chat about ideas for recreating some of the buzz about the place. We kicked around a few ideas to be explored later, but as a first step, he suggested that I come in for a meal as his guest and also meet new Head Chef, Patrick. If you have ever heard a piece of music that you once knew well but haven’t listened to for years and found that with the passage of time it seems to sound somehow different despite its familiarity, you will understand how I felt returning to d’Arry’s after an absence of several years. Yes the edgy, funky decor was still all there – the bare-brick walls, up-turned, cut-off wine bottles for candle holders, the rustic logs and ornate picture frames – but it somehow seemed different. Of course, it’s not d’Arry’s that has changed but Cambridge with several new openings that also do this modern, juxtaposed, mixed-up style of interior design and what was once edgy now feels as though it’s starting to become part of the mainstream. Arriving for a Sunday lunch, we were welcomed by James and opted to sit indoors by the window overlooking the street – the layout of d’Arry’s is somewhat unusual as you enter to see a courtyard straight ahead and either turn left into a private dining area or right into the main restaurant and bar section. Eschewing starters, we went straight into ordering main courses; the children chose fish and chips and a Sunday roast, Mrs CWB opted for a trio of fish and I followed James’ recommendation for duck breast on sweet potatoes with garlic, ginger and a raspberry jus. Wines to match the adults’ meals were brought and whilst the match for the seafood with asparagus was a fairly predictable “Broken Fishplate” Sauvignon Blanc, I was initially a little surprised at the choice of a Stump Jump Riesling for me. However, it proved to be inspired, as the acidity of the wine cut through the strong garlic and ginger flavours whilst it had enough body to stand up to the meatiness of the duck. I have historically been rather unimpressed with Australian Riesling, finding it generally too lean and limey for my taste but this one was a great food-friendly easy-drinker with a soft fullness, good zesty, citrussy acidity, a touch of sweetness and a balanced minerally finish. On the palate it felt weighty and fleshy and had the toasty aroma of fully ripe, thick-skinned grapes. The Sauvignon had a similarly rounded and easy-drinking yet sensible feel with lots of varietal herbaceous aromatics on the nose, crisp mouthfilling acidity on the palate and a minerally finish. Criticisms, if there can be any, are that the wines were served perhaps just a degree or so too warm and that the glasses were a little chunky and undersized for proper appreciation. Part-way through our meal new Head Chef Patrick popped out for a chat and explained that he had previously run a multi-awarded hotel kitchen in Great Yarmouth on the North Sea coast, catering mainly for high-flying oil, gas and renewable energy people transiting through. Arriving at d’Arry’s to find there had been no head chef for several months, Patrick spent the first part of his time just rebuilding the basics but is now looking to put his own stamp on the menu which has some central themes and standards (d’Arry’s is part of a small independent chain which gives a certain degree of buying power for raw ingredients), but does allow for personalisation as well. Originally from South Africa, his influences are Pacific Rim fusion, as evidenced in my duck with garlic and ginger, plus use of fruit from his homeland. I don’t know too much about South African food, but I can’t help feeling that Asian fusion has become a little passé and the buzz these days is more around either rustic Italian or sherry bar tapas. I also think they may be missing a trick of the zeitgeist in not offering a local and / or seasonal menu – not least because Cambridge is in the middle of farming country with several good farm shops within easy reach. That said, the menu does feature more classic dishes such as scallops, smoked salmon and devilled kidneys and in any case our food lived up to my expectations of what d’Arry’s should be – well-made food from good quality ingredients, unfussily prepared and served with just the right amount of panache. However, puddings were the real highpoint of the meal and we opted for a mango and ginger cheesecake whilst the kids chose vanilla ice cream and chocolate fondant. These were some of the best puddings I’ve had in Cambridge – the cheesecake was light yet rich and perfectly balanced, whilst the accompanying dessert wine, The Noble Prankster, was deliciously syrupy with marmalade, peach, apricot, a touch of botrytis and some hints of Christmas spice and mixed peel with a balanced sweet-sour finish. Purely in the interests of research, I also sampled the kids’ puddings and they were extremely good, too – the ice-cream was rich, creamy and flecked with vanilla, whilst the chocolate fondant was perfectly cooked on the outside and deliciously, stickily gooey on the inside. Over coffees, I talked to James more about the pub and its clientele; he explained that it has a strong core of very loyal regular customers who appreciate the value that it offers. This strikes me as a good base to build from if the place can introduce some new and interesting changes at a rate that doesn’t alienate existing customers, but a path that could lead to a downward spiral of increasing focus on value and downward margins if unchecked. Current offers from d’Arry’s include a Friends of d’Arry’s scheme and a Punt &amp; Lunch flyer. These represent good value for the consumer, but to me are merely pricing strategies rather than the kind of exciting, buzzy innovations that will get people talking about d’Arry’s as a must-visit place again. It would be great to see d’Arry’s back on the radar of smart eating places in central Cambridge and, with the possibilities offered by its wine list and private-dining space, I don’t think it will take too much to get there. 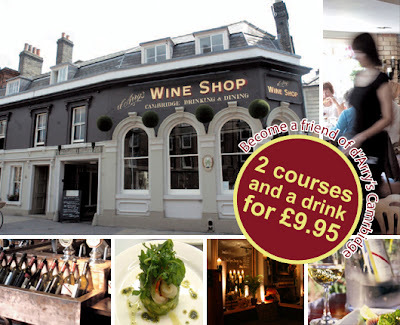 A two-course a la carte meal with a bottle of wine and coffee at d’Arry’s Cambridge costs around £70 for two people, whilst the Friends of d’Arry’s offers two courses and a glass of wine for £10. Tagged restaurant, wine. Bookmark the permalink.